Julie Overton and Jonathan VanDerveer (JV) can connect almost every significant moment of their relationship to a situation involving Buffalo Wild Wings. After years of friendship, Julie planned to profess her love for JV after an evening among friends at the local Richmond, Virginia, location. And when it was time for JV to get down on one knee and propose to her, he added a special Buffalo Wild Wings twist. Long before they were a couple, engaged or planning a wedding, JV and Julie became friends in March 2013 in Richmond. While there was always a spark between the two, their relationship wasn’t destined to develop into anything more than friendship at the time. She left for college in August 2013 and moved to Florida two years later for an internship. Over the years, despite their time apart, Julie never lost touch with JV. “Every time I went back to Richmond, I made it a point to text him to see if he wanted to hang out and get drink or just to spend time together,” Julie said. When she finally moved back to the Richmond area, Julie and JV rekindled their friendship almost immediately. Buffalo Wild Wings became their frequent hangout spot, sometimes spending three or four nights a week at the sports bar alongside their friends and co-workers. Finally, four years after meeting, Julie mustered up the courage to tell JV how she felt about him following an evening at Buffalo Wild Wings. JV was quick to reciprocate those feelings and over the next year, as their relationship developed, he put the wheels in motion to propose. Jonathan VanDerveer’s proposal to Julie Overton involved Buffalo Wild Wings, candles and ‘MARRY ME’ spelled out in celery. In November 2018, as he anxiously awaited Julie’s arrival back at their home, JV put together a spread that included Buffalo Wild Wings, candles in the shape of a heart and “MARRY ME” spelled out in celery. When she walked in the door, JV dropped to one knee, pulled the ring from an extra Buffalo Wild Wings to-go box and asked her to marry him. “We joke that our relationship started at Buffalo Wild Wings. 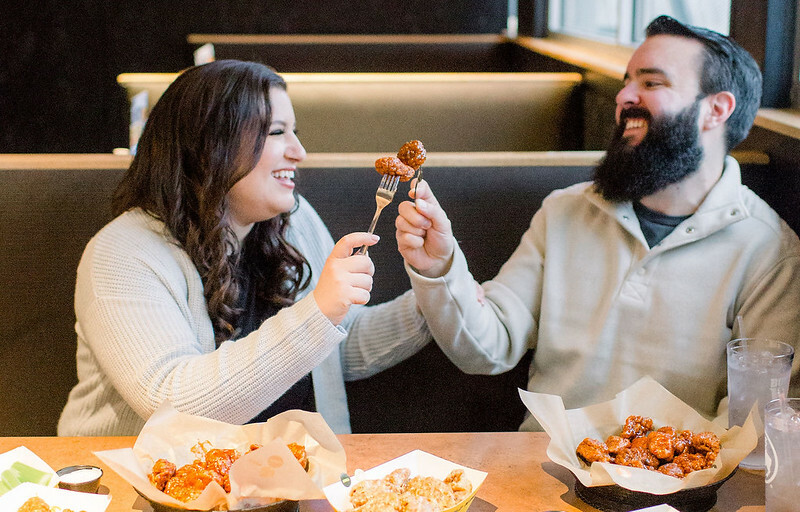 After hearing about their unique engagement, Buffalo Wild Wings coordinated a photoshoot with Virginia photographer Erika Mills to celebrate the couple’s upcoming marriage. Makeup was also provided by Virginia Beach-based BlushTones. Additional photos can be seen on Buffalo Wild Wings Twitter, Facebook and Instagram. JV and Julie plan to walk down the aisle in October 2019. And while they haven’t quite pinned down what their menu at the wedding reception is going to look like, they are undoubtedly considering Buffalo Wild Wings for some late-night bites.